Shinkansen station and local lines are adjacent to each other. Tourist Information centers are located inside the Shinkansen gate and next to the central exit. Hiroshima and Miyajima are so famous among foreign tourists that it is hardly necessary to introduce them on this page. However, we would like to introduce a few special twists! 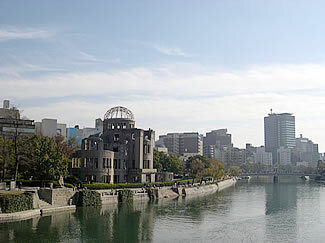 Hiroshima, like Venice, is a city that is built around water; some parts are even below sea level. The Ota River splits into six arms to form a large delta, where the city is situated. 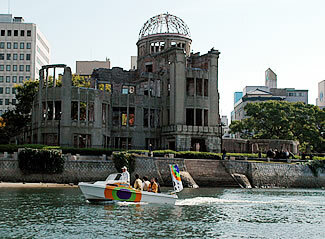 Off course, most tourists stop here to visit the Peace Park, the Atom-Dome and the Peace Memorial Museum. During the reconstruction process after the atomic bombing, plans were made to create a city with much more space and greenery than other Japanese cities. Luckily, most of these plans came to fruition, and you can now enjoy walks along green riversides in the middle of the city. Open cafes were started in autumn 2005 along the river close to the station. From the Main (South) Exit of Hiroshima station, take the underground passage to Ekimae-Ohashi Bridge, over the river, past the 21 Century Hotel, until you hit the streetcar line. Follow the rails to the right, cross the next river and you will find the place. Gangi are steps that lead into the water - this used to be the common connection between land and water along rivers and sea coasts. In Hiroshima, over 100 Gangi were found to be usable. Gangi Taxi will take you around the rivers and to a choice of 50 landing places for 500 Yen per 10 minutes. A Gangi Taxi is a small, open boat, so it might not run during bad weather! The two boats Kirara and Rururu run between the Pier in front of the Resthouse in Peace Park and Miyajima in a 45 minute trip. While the price is a bit steep (1900 Yen one way, 3000 return), it is a nice way to enjoy a rest and the change of landscape from the urban rivers to the islands of the Seto Inland Sea while moving from one site to the other. Boats run five times a day. River cruises also run from the same pier. Please make a reservation and check departure times, as they vary according to tide conditions. There are many business hotels and also a Japanese Inn Group inn in Hiroshima. Look on Gethiroshima homepage for helpful hints. If you want to stay by the sea, the Prince Hotel close to Ujina port sometimes has good offers and can be reached by bus from the station. From there, you can take a boat directly to Miyajima (1460 Yen). All the information you need to enjoy life or just one evening in Hiroshima. This is probably the most famous island of Japan, as its red Torii (shrine gate) adorns many guidebooks. English homepages of city, tourism association and Inn association give you all the information you need ? even when the tide is in, so you can see the red gate really in the water! If you are looking for some peace and quiet during an exhausting trip, we suggest you spend a night on the island. If your budget is limited, the three places recommended below are the best choice. At the upper end of the scale, you can spend as much as 30.000 Yen per person! There is one more reason to stay over night: to have time to climb Mt. Misen. Legend has it that this mountain was designated a religious site 1200 years ago (2006 will be the 1200-year ceremony). Several paths lead up Mt. 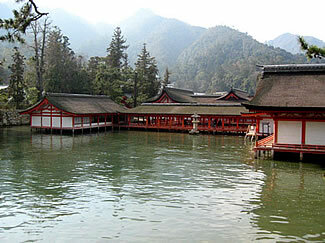 Misen, but the one furthest away from the Itsukushima Shrine, the Omoto-course, is the most scenic and natural. 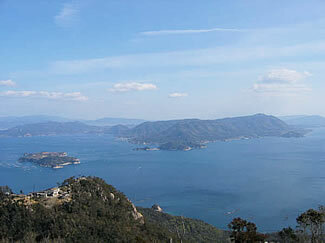 Allow two hours to get to the top, from were you have a breathtaking view of the Seto Inland Sea. Although the mountain is only 530 meters high, don’t forget that you start from zero ? most of the paths are rather steep. If you are too tired to walk down, you can take the ropeway. The ropeway station is about 20 minutes from the mountain top. A simple map with the hiking paths is available at the tourist information at the port. Most of the signs are in English, but the many small temples and sites around the top of the mountain can be a bit confusing. If you long for the sea, Tsutsugaura Park on the “backside” (=east) of the island offers a beach and campsites. It can be reached by rental bike or bus from the port. If you continue cycling along the coast, you will also find some smaller beaches. Last but not least, if you happen to be in Japan in July, you should not miss the Kangensai Festival , where beautifully decorated fishing boats gather in Miyajima and carry the shrine deity around to some smaller shrines on the island. In the final part of the ceremony, which takes place shortly before midnight, the deity is brought back to the main shrine. Guesthouse Kikukawa is a small inn with an interesting blend of Japanese and Western style. Miyajima Mori no Yado is a public accommodation facility in a quiet location on the far side of the shrine. Ryoso Kawaguchi is beautifully renovated; and is a member of the Japanese Inn Group. A variety of half-day cruise sets are available from Hiroshima, but all the information is in Japanese. The best offer is the Setouchi osanpo cruise (Walk around the Seto Inland Sea Cruise) that is offered on weekends from September to November. A very simple way to cruise the Seto Inland Sea is the regular ferry (10 boats per day) from Hiroshima to Matsuyama on Shikoku. On the comfortable 3 hour ride, you can enjoy the landscape of islands and sea at its best, sitting outside and enjoying the breeze. If you don’t have much time, the high-speed boat (running every hour) will take you there in 75min., for more than double the price.